In our previous blog, Brand Storytelling for the Digital World – Web Design, we had discussed 9 crucial things to keep in mind when planning your brand website. But, in today’s age your brand website can be much more than a place to just create your digital brand experience. It can also serve as an e-commerce portal to display & sell your products/services. A customer hears an awesome review about your new supermarket from a friend and pays a visit. After you describe all the products in your range for almost half an hour, he finally picks one after great deliberation. He’s ready with the cash at the point-of-sale, but the cashier at the counter is on his lunch break. He approaches the cashier on the next counter, but the cashier bluntly tells him that the item is from the X category & he cannot process the sale unless the first cashier comes back from his break. Fed up, the customer leaves without making a purchase & tells 10 other friends about his horrendous experience. The above might sound like an improbable scenario in real life, but this is exactly what happens in the digital world if you have an inferior quality of e-commerce website. 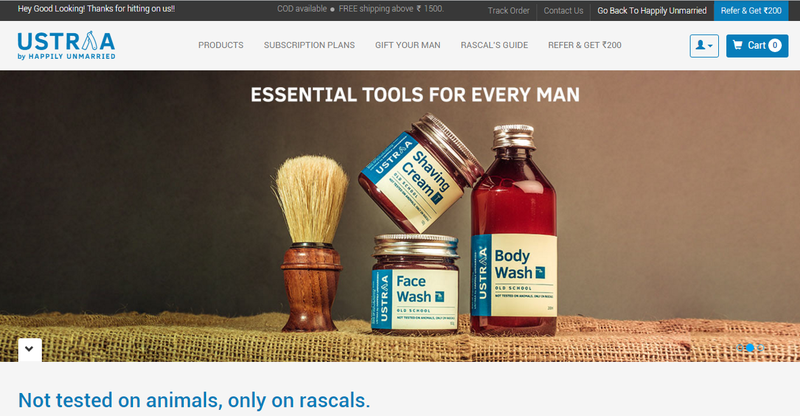 A good e-commerce store is not just aesthetically pleasing but based on the insight that – the quicker the customer can get from landing page to the completed order – the more likely they are to actually give you their money and make the purchase. There is a sizable number of e-commerce platforms to choose from – Shopify, Magento, Buildabazaar and so on. Make sure to compare features like inventory management, payment gateway options & customization options before choosing a platform. You can read a more in-depth piece of the things you need to look out for here because this is one of the more important decisions when planning your e-commerce development. Shoppers won’t always search with the right keyword/spelling on your e-commerce site & this might lead them to a ‘no results found’ page. An intuitive auto-complete will prevent this & can also show thumbnail images of the said product. It’s easy to add this feature using plugins like swiftype, nextopia etc. Today, online shopping is not just limited to the desktop. In an age where e-commerce platforms like Myntra are moving to an app only versions, you cannot afford to have an e-commerce site which isn’t adaptive for different devices like smartphones, tablets & phablets. Creating a responsive site from the start will allow for better planning & structuring as compared to adapting an existing desktop website for other devices. As I said in my previous blog, every element related to your brand should be in synergy with the overall story so that you can create an effective brand experience. Planning your e-commerce development based on your brand personality, target customer persona & competition is more rewarding than using existing templates in the longer run. When it comes to online shopping – seeing is believing. You cannot entice a potential customer through any other sense. So, make sure to you use good photographs, lots of them. You should also consider having multiple photos from different angles, photos for different color/size variants of the same product. Customers might not always know what category a product might be in. An easy to locate search bar will also invite shoppers to look around more & therefore should be one of the key elements of your e-commerce site. 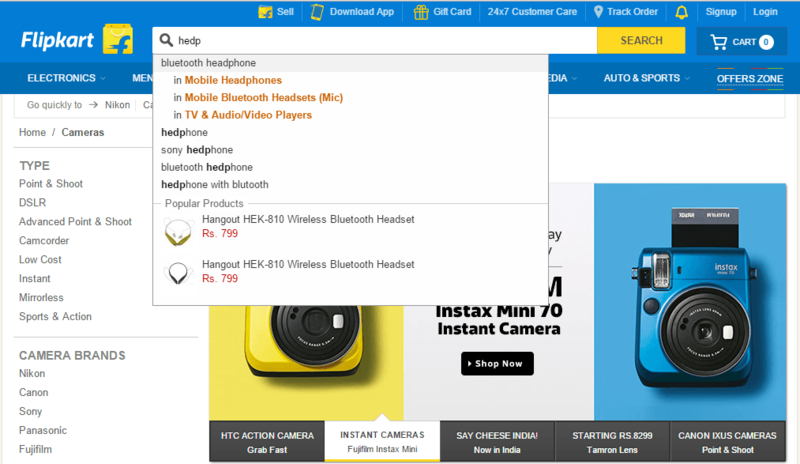 Flipkart‘s search bar- a constant at the top throughout the site, invites the shoppers to look around. No matter how great your content writer is when it comes to writing the product description, a customer is more likely to trust a review from another customer who’s bought & used the same product. And don’t fret about the negative reviews; just make sure you address & try to resolve each one them. Yes, getting shoppers to register is important to create a good data bank of all your customers. But, remember – all online shoppers hate the long and tedious sign-up process before finalizing a purchase. Consider allowing them to sign in using social media accounts like Facebook or make sure you’re rewarding them with a discount coupon or a special merchandise for doing so (also great opportunity for your branding). 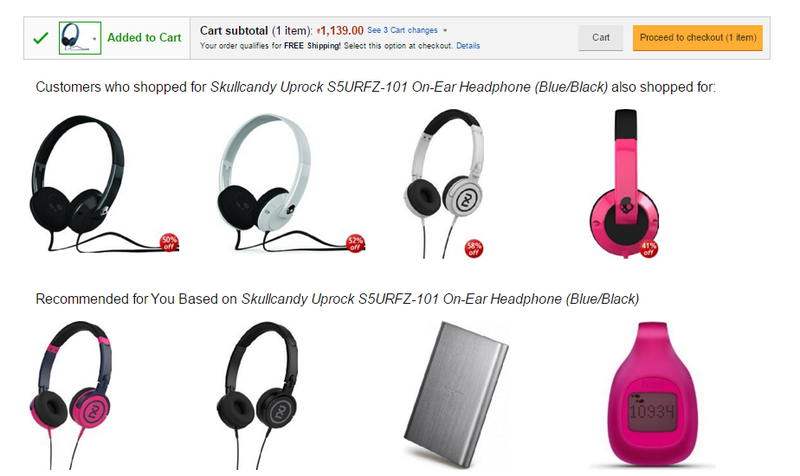 Removing a product from your site every time it’s out of stock is impractical, but you need to make sure that your customers know when items are out of stock, to avoid a fiasco like Flipkart’s Billion Day Sale. You can also integrate an inventory management tool like Expandly to ensure that you don’t oversell. It’s important to make the shopping cart easily visible on every page of your site. This will allow you to not take a shopper straight to the checkout after he selects a product. For example, most sites suggest related accessories like screen guard, speakers, an external hard drive etc. when a customer buys a laptop. This intuitiveness saves the customer’s time & increases your retention & revenue. Your customers will definitely feel cheated if you display a product’s price as 100 rupees & add 10 rupees extra at the time of check-out as delivery charges. Avoid this by displaying all additional charges like taxes, shipping & handling charges along with the price itself. Although the social media channels might not attract a lot of active participation in your particular field, it plays a big part in SEO and backlinks. For example, when it comes to fashion-related products, a simple ‘pin this’ might go a long way in getting more customers to visit your website. Once a customer has reached the checkout, make sure to provide them an hassle-free way to complete the order. Avoid being greedy & promoting more products or deals on this page. Remember- complicated checkout procedures often lead to abandoned carts. You need to plan clearly for the desired customer action after they view a product on your website. It can be an ‘add to cart’, ‘add to wishlist’ or ‘explore more’ button – but make sure that the buttons are visually attention grabbing by using bold fonts, contrasting colors & are not getting lost in the clutter. The easiest & the most effective way to ensure a memorable brand experience is to provide your customers a personalized experience. Apart from the usual wishlist and buying history, you can also make sure that someone who viewed say, 10 different shoes during their last visit on your site, sees the current ‘50% off on all shoes’ banner at the top itself. Your e-commerce site must have a secure payment gateway & make sure that all visitors are aware of it through proper security certifications. Pay extra attention to eliminating all payment glitches. No matter how amazing your product range is, a customer is bound to leave with a bad experience if he’s not able to make the purchase after a few attempts. P.S. 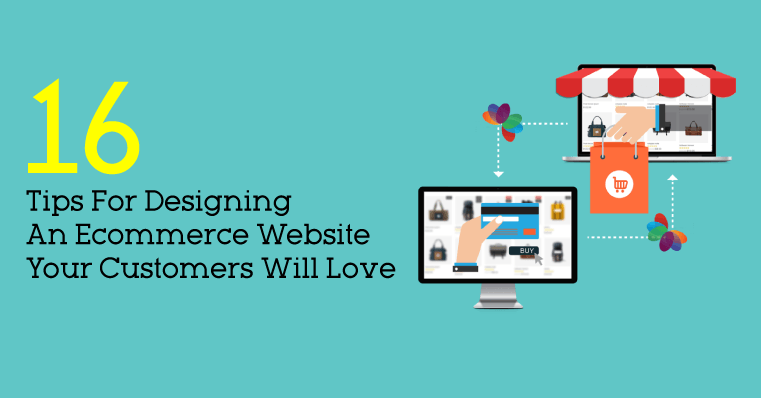 If you’re planning to build an e-commerce site that your customers would love to buy from, get in touch with us.